When I saw this book on the shelf at the public library my interest was piqued. I was raised by parents who believed in the power of books, and as children, my siblings and I were read to on a daily basis. Some of my most powerful and comforting memories are of my parents reading to us as we lay strewn across one bed or another, cuddled on the chesterfield, or in the car on long drives. When I was about five, Mum bought me a complete set of Laura Ingalls Wilder's books and they were treasured possessions throughout my childhood, read and re-read and re-read. But more than Laura Ingalls Wilder, it was Lucy Maud Montgomery who stirred my soul. A perennial favourite after Anne of Green Gables was Rainbow Valley. As children of the manse we felt a connection with the wild motherless children who accidentally and scandalously did their spring cleaning on a Sunday morning! As we got older she read us more adult books such as the autobiography of Johnny Cash, The Man in Black which required, I am sure, some judicious on-the-spot editing. I was powerfully affected by Corrie Ten Boom's The Hiding Place and even that gem of the Christian gangster genre, The Cross and the Switchblade. This book is the story of a elementary school librarian father and his daughter who had a habit of reading together in the evening, but when she was nine years old they made a promise to read together, initally for one hundred consecutive nights, and then one thousand, and their streak ended up continuing for almost nine years. Jim Brozina, Alice's dad, has written a touching tribute to his daughter in the foreward. A single dad who clearly loves books, he finds a way to connect with his daughter through a daily commitment to spending time together. What a gift! Light-hearted and humourous, Alice Ozma (yes, named for that Alice and that Ozma) records the inspiring journey she and her father take to accomplish The Streak. They read on the phone during impromptu middle-school sleepovers, on the train, on prom night, and touchingly, on the day he delivers her to university. They read their way through classics and modern issue-driven stories and series. From Dickens and Lois Lowry to Jerry Spinelli and Shakespeare, Alice Ozma reflects on what that commitment meant to her, and how it shaped her life. In a simple writing style she presents vignettes of their life together. Other members of their family and even friends and extended family fall into the background; this is the story of father and daughter, and their shared love of books. Alice Ozma has a lovely narrative voice, enthusiastic and fresh, and she takes on the challenge of writing a memoir at such a young age with honesty. At times the memoir aspect of the story unnecessarily superceded the theme of reading, and since her mother did not appear to be a big part of her reading life, it might have been more prudent to leave her involvement out. However, by including stories of her mother's rather dramatic shortcomings (infidelity, suicide attempt and abandonment) she does make it clear that she had challenges to deal with, and that reading was a healthy escape for her, and a way for she and her father to bond during trying times. What I feel is missing from this book, and what I would have loved to have heard more of, is how she and her father interpreted the books they read, how they were affected and challenged and comforted and supported by them. 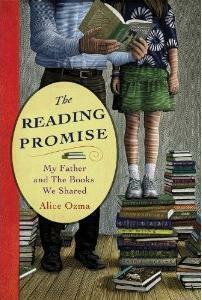 Alice Ozma and her father, Jim Brozina are both in their own ways continuing to champion books and reading, especially for young children. The final chapters which document the decimation of her father's life work in the public school library which led to his early retirement leaves us hanging Apparently this will be reconciled in the paperback version which will include updates on the past few years since the book was written. I would recommend this book for parents keen to incorporate reading into the lives of their young children, for educators, and for those with booky childhoods as a bit of nostalgia.